Medical alert devices can be lifesaving for seniors who find themselves in an emergency situation. They also can reduce stress and anxiety for caregivers by providing peace of mind that a loved one will be able to get the help they need after an accident or injury. There are numerous medical alert systems on the market today, the majority of which are traditional in-home units and mobile options for more active seniors. In recent years, some companies have started offering smartwatch-style devices, which offer a fresh alternative for caregivers looking to provide their loved one with extra protection. Smartwatches add enhanced features to the mix that take the benefits of medical alert systems to the next level and may be more appealing for many seniors. Smartwatches are generally fairly stylish and look like a “regular” watch. This is a big improvement over traditional medical alert devices, which are sometimes bulky or can make seniors feel self-conscious about wearing them. 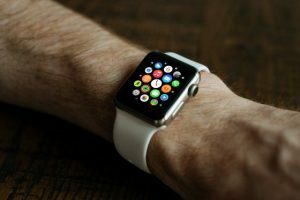 Smartwatches may be easier to adjust to wearing, especially for seniors who are used to wearing a watch. This is one of the most important benefits of medical alert smartwatches. As anyone who has experience purchasing a medical alert device for a loved one knows, getting seniors to regularly wear the device can be a challenge. And, the device only works if your loved one actually wears it. Smartwatches make it more likely that your loved one will wear the device regularly and be protected in the event of an emergency. Traditional medical alert systems typically have two components: a base station and a wearable personal help button. Even some mobile devices have two pieces that users must always have on them. Smartwatches function alone, meaning there are fewer pieces for your loved one to remember to wear each day. Again, this factor can help seniors feel more comfortable wearing the device, which means that they will be better protected. Activity Tracking: Most smartwatches track data such as users’ activity levels and daily steps taken. Some of them upload this information to a caregiver portal so family members and caregivers can view the information, and even send alerts if something seems abnormal about the users’ activity. Messaging and Calls: This is not as widespread as the other features, but some medical alert smartwatches allow users to send text messages or make or accept calls through their watch. This makes medical alert smartwatches very similar to standard smartwatches. MobileHelp Smart. This device is not a fully functioning smartwatch- users cannot use it to send text messages or make or receive phone calls (other than calls to the monitoring center). However, it does have many other helpful features such as heart rate monitoring, activity tracking and weather reporting. The MobileHelp Smart does have a two-way speaker for easy communication between users and a monitoring center during an emergency. Freedom Guardian. The Freedom Guardian provides emergency monitoring as well as typical smartwatch services. Some of these features include voice-to-text SMS messaging, activity tracking, customizable alarms for things like medication reminders, and weather forecasting. Caregivers can download an accompanying app that allows them to track their loved one’s activity, giving them peace of mind that their loved one is safe. Apple Watch. The Apple Watch is not a medical alert device on its own, but apps such as FallCall Lite and Alert provide Apple Watch users with emergency protection. The apps make it easy for users to contact caregivers and loved ones via their smartwatch by simply pressing a button on the watch or its screen, mimicking personal help buttons. This is a great option for those who want all the bells and whistles of an Apple Watch, but who will also benefit from emergency monitoring. However, smartwatch apps typically only connect users to caregivers and other preferred contacts, not an emergency monitoring center. Smartwatches are making medical alert devices more appealing and practical for seniors and can be a major stress-reliever for caregivers who worry about their loved one’s safety. If your loved one has been resistant to the idea of a medical alert device in the past, smartwatches could provide a new opportunity for them to get the life-saving protection of a medical alert system. Do you think your loved one would benefit from wearing a medical alert smartwatch? Comment below or join the conversation on our Facebook page. If your loved one needs care in the home, and you need support in caring for them, we can help. Contact FirstLight Home Care today. Physical activity is so important for Dementia and Alzheimer patients. My grandmom had benefited from that since she was diagnosed with Dementia. Thanks for writing this article. She also benefits from this device https://www.geoguardpro.com These guys helped us to not be so scared to let her go outside. Thank you for sharing, Jorge. You are spot-on in regards to the importance of physical activity for those with Alzheimer’s and dementia. And thanks for reading!